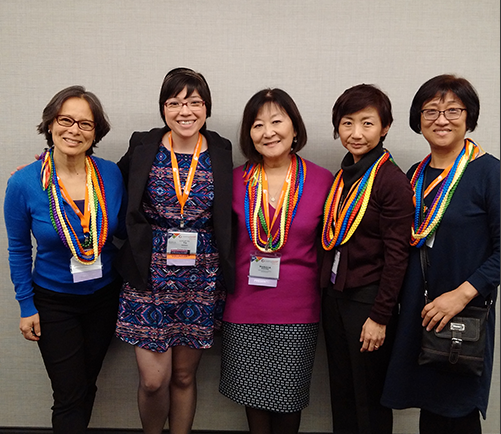 From left: Laurin Mayeno, Christina Adams, Marsha Aizumi, Clara Yoon and Joanne Lee. We, the Asian American Parents Who Love Our LGBTQ Kids, are heartbroken about the Orlando tragedy. Our thoughts and prayers are with the victims and their families, both given and chosen, especially their parents. Our thoughts are with those who were injured and are still fighting for their lives and those who are suffering emotional trauma. Our hearts go out to our LGBTQ community that is shaken by this horrible news and the loss of their friends and community members, particularly in the Latina/o community. We support our LGBTQ children and we are proud of who they are. However, we are concerned because we know this world is not 100 percent safe for them. We condemn this type of unthinkable, senseless violence against the LGBTQ community. Our children are not people to be extinguished; they are loved and cherished and deserve to live their lives fully without hatred and bigotry. We also stand in solidarity with Muslim families, especially parents with queer Muslim children. Many of our South Asian families are from Muslim backgrounds and they are our siblings in this fight against homophobia and transphobia. Our hearts are with our LGBTQ South Asian and Muslim community members who are reeling in pain from yesterday’s attack and feeling the combined pain of Islamophobia, homophobia, and racism. We stand in solidarity with you. If you are the parent of an LGBTQ child and are having a hard time, we urge you to reach out to other parents for support. Even if you are struggling to accept your LGBTQ children, this is time when your child needs your understanding and support. Reach out to your child and share your fear and worries, but do let them know you would be there for them. Our children need our unconditional love and may need our shoulders to cry on.